Resistance profiling of bacterial isolate from cut and sliced ready- to-eat polyethylene packed watermelon (citrullus lanatus) sold in akoko communities. The study surveyed of cut ready- to-eat polyethylene packed Watermelon (Citrullus lanatus) sold in Akoko communities for antibiotic resistant Organisms. Samples were purchased from different selling points within Akoko communities. The collected samples were analysed in Microbiology Department, faculty of Science, Adekunle Ajasin University, and Akungba Akoko in triplicates. A total of 100 cut pieces of ready- to- eat polyethylene packed watermelon were randomly collected from 10 selling points at 10 per selling point using nutrient agar, MacConkey sorbitol agar, Eosin methylene blue agar and Manitol salt agar. The isolates were identified based on their physiology, cultural morphology and biochemical characteristics using API 20E sugars kit. Disk diffusion method was used for the screening for antibiotic resistance of the isolates. Ten isolates was observed from the samples examined. Six (6) Gram positive bacteria were counted ranging from 3.1 to 7.5 × 104 cfu/g and four (4) Gram negative bacteria were counted ranging from 0.3 to 3.2 × 104 cfu/g. The isolates were resistant to all the antibiotic used with the exception of Ciprofloxacin and Gentamycin for gram positive organisms and Ofloxacin and Gentamycin for gram negative organisms. Therefore the direct consumption of ready-to-eat cut watermelon from vendors can be a potential risk for food borne infection and food poison because of their contamination indication ratio and the variable resistance patterns in response to different antibiotic used in this research. Resistance profiling, cut ready- to-eat, packed watermelon (Citrullus lanatus). Watermelon with the scientific name (Citrullus lanatus) is a scrambling and trailing vine in the flowering plant family Cucurbitaceae. The species originated from southern Africa, with the evidence of cultivation from Ancient Egypt. It is grown in tropical and subtropical areas worldwide for its large edible fruit, which is special kind of berry with a hard rind and internal division, botanically called Citrullus lanatus). Watermelon is usually produced in the Northern States of Nigeria and brought to the markets from where the street vendors obtain their stock. The sweet juicy flesh is usually deep red to pink with many black seeds although seedless varieties have been cultivated. The fruit can be eaten raw or prickled and the rind is edible after cooking . Over the years, there has been a significant increase in the consumption of sliced ready to eat watermelon because they are easily accessible, convenient, nutritious and most especially, cheaper than the whole fruits. The increase in the consumption of sliced ready to eat has been linked with a parallel increase in food-borne illness. Sliced ready to eat commonly consumed in Nigeria include paw-paw, pineapple, watermelon and salad vegetables. Watermelon are usually sliced ready to eat, packaged in polyethylene bags and sold by street vendors. Their increased consumption, coupled with the associated risk of disease to which consumers may be exposed, is a matter of great concern. It is difficult for one to attest to the hygiene of the processors or to the sanitary conditions at points of preparation. Moreover, the case is worsened by the fact that sliced ready to eat watermelon street vending is done without adequate storage conditions, thereby exposing the sliced ready to eat watermelons to flies and other disease-causing agents. The sliced watermelons are processed and sold by unlicensed vendors with poor education levels and untrained in food hygiene . Vendors of street foods usually make use of simple facilities like wheel barrows, trays, mats, tables and make-shift stalls, thus further increasing the risk of food contamination. Contamination or cross-contamination of street foods, especially sliced fruits and vegetables, are increased by unsanitary processing and unauthenticated preservation methods. The use of dirty utensils, as well as the open display of street food produce encourages sporadic visits by flies, cockroaches, rodents and dusts . This is an eye opener to the populate, how unwholesome food and vegetable like sliced watermelon were been sold to the populate which should be discouraged through all form of awareness’ like publishing data collected during research work of this magnitude and also to demonstrate the inherent danger in this cut and sliced ready- to-eat polyethylene packed watermelon (Citrullus lanatus) and other associated food sold in our local environs. 100 samples of ready-to-eat polyethylene packaged sliced watermelon,were purchased from different location in Akoko area of Ondo state, Nigeria from different fruit sellers. They were kept in sterile bag and transported to microbiology laboratory in AdekunleAjasin University AkungbaAkoko for analysis in ice container. Nutrient agar, MacConkey, Sorbitol agar, Eosin methylene blue agar and Manitol salt agar were used for the isolation and enumeration of viable bacteria count, from the cut and sliced ready-to-eat watermelon samples collected from different locations. The media were prepared according to manufacturer’s specification and brought to homogenous solution by boiling using hot plate to ensure that the agar powder is totally homogenized and immediately autoclaved at 121oC for 15 minutes [4,5]. Bacteria colonies, shape, colour, size, edge, elevation and surface texture were observed after 18-24 hours of incubation. Characterization of the isolates was based on physiological, morphological and biochemical characteristics according to Bergey’s Manual of Determinative Bacteriology , confirmed using API kit 20 sugars. Antibiotic susceptibility patterns of all confirmed isolates were performed on Mueller-Hinton agar (HiMedia Laboratories Pvt. Ltd., Indian). Standard disk diffusion method as recommended by NCCLS. Eight commonly used (mg/disk) antibiotics ofl=ofloxacin, cn=gentamicin, s=streptomycin, caz=ceptazidime, tet=tetracycline, pef=pefloxacin, cfx=cefotaxime and amp=ampicillinwere tested. Using overnight nutrient broth culture of confirmed isolates was diluted to 0.5 McFarland turbidity standards using sterile saline. 0.1ml of dilution for each bacterial culture were aseptically transferred on the surface of the dry agar and spread over the entire surface using sterile glass spreader. Antibiotic discs were then aseptically and cautiously placed on the seeded agar plates. The plates were incubated at 37°C for 18 to 24 h. the zones of inhibition were measured in millimetre. The results of the microbial contamination of the 100 cut and sliced ready- to-eat polyethylene packed watermelon (Citrullus lanatus). (Sliced) collected from different fruit vendors in Akoko area, in Ondo State, is presented in the following tables. The result of the average microbial load of the vended fruit samples in Colony forming unit per g (CFU/g) are shown in (Table 1). It reveals that samples collected from University small gate 1 has the highest average total aerobic plate count of 9.1 × 104 followed by Akungba car park, 7.5 × 104, while Ishua and OgbagiAkoko main market both have 7.2 × 104 respectively. IkareAkoko main market had the least count of 3.1 × 104. The result of percentage occurrence of isolates in ready-to-eat polyethylene packed watermelon samples (sliced) Bacillus cereus had the highest percentage occurrence of 12.3%, while Staphylococcus aureus and Escherichia coli followed with 11.9% while others Bacillus subtillis, Staphylococcus epidermidis, Salmonella typhi, Pseudomonas aeruginosa, Klebsiella pneumonia, Streptococci pyogenes and Proteus vulgaris have percentage occurrence ranging from 7.7% to 10.0% are shown in Table 2. The morphological and biochemical characteristics of the microbial isolates from the ready-to-eatpolyethylene packed watermelon samples (sliced), reveals that a total of ten (10) micro-organisms were isolated are shown in Table 3. Out of these isolates, five were gram positive bacterial isolates namely: Staphylococcus aureus, Bacillus cereus, Staphylococcus epidermidis, Streptococci pyogenes, and Bacillus subtillis. And the remainingisolates were gram negative bacterial isolates namely: Salmonella typhi, Pseudomonas aeruginosa, Klebsiella pneumonia, Proteus vulgaris and Escherichia coli. All the bacterial isolates are rod-shaped except for Staphylococcus aureus, Staphylococcus epidermidis and Streptococci pyogenes that are cocci in shape. The distribution profile of resistant presumptive organisms to common antibiotics is shown in Table 4. 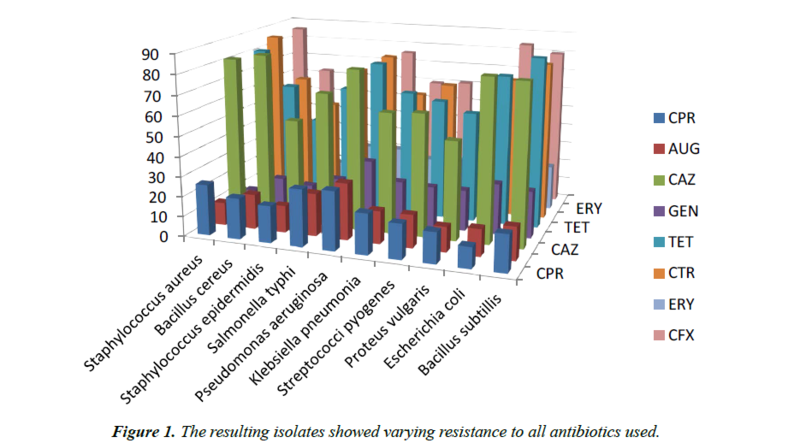 The resulting isolates showed varying resistance to all antibiotics used (Figure 1). Figure 1: The resulting isolates showed varying resistance to all antibiotics used. The isolates obtained included Staphylococcus aureus, Bacillus cereus, Staphylococcus epidermidis, Streptococci pyogenes,Bacillus subtillis, Salmonella typhi, Pseudomonas aeruginosa, Klebsiella pneumonia, Proteus vulgaris and Escherichia coli at various percentages (Table 2). Presence of these organisms in fruits had been reported by [7-9]. These researchers have linked most contamination of sliced fruits, to processing and rinsing with faecally polluted water used for washing utensils (e.g. Knives, trays, pan and wrapping material), and the exposure of these products to low temperature. The presence of these organisms in counts beyond the safe limit may be due to the nutritional composition and available water in the fruit, which are very beneficial for the growth and survival of the microorganism. Bacillus cereus has highest percentage occurrence of 12.3%. This is further supported by the work that isolated Bacillus cereus from ready-to-eat vegetable salad, water used in irrigation and ready-to-eat fruits as reported in their studies [10-13]. While Staphylococcus aureus and Escherichia coli followed with 11.9% this study is in line with the report which reported the presence of Bacillus cereus, Escherichia coli and Salmonella typhi ready-to-eat vegetable salad vended in Tamale, Ghana . It is been reported that presence of E. coli in food samples was an indication of faecal contamination and improper hygienic practices by food vendors. The presence of Staphylococcus aureus, Pseudomonas sp, Salmonella sp and Escherichia coli was reported from pre-cut fruits sold in Ilorin . The presumptive isolates showed varying resistance to common antimicrobial agents (Table 4) [15-18]. Pathogenic bacterial are the common contaminants of our fruits, they could be easily transferred from the vendors to the processed fruits through unhygienic and improper food handling. The consumption of ready-to-eat fruits directly from street vendors or hawkers constitutes a likely health risk and potentially increases the risk of food-borne diseases caused by a wide variety of pathogens, because it is difficult to monitor the hygiene of these vendors or the sanitary conditions at points of processing as well as the packaging of the said materials . The present study revealed that ready-to-eat watermelon sold by street vendors in Akoko Area in Ondo State constitutes a likely health risk to consumers in terms of microbial quality. This study shows there is the urgent need for the improvement in food safety and quality standards, due to the presence of contamination showing variable resistance patterns to commonly used antimicrobial surveyed in this research so that the health management system is not overburdened. Barro N, Bello-Abdou IR, itsiembou Y, et al. Street vended foods improvement; contamination mechanism and application of food 2007. Yeboah RWN, Kun Ze D, et al. Fruits Grown in Ghana for Export.IN Abano. E.E., vegetables sold in Sango Ota, Nigeria. African Journal of Food Science 2004;4:291-296. Zimmermann G. The entomopathogenic fungi Isariafarinosa (formerly Paecilomycesfarinosus) and the Isariafumosorosea species complex (formerly Paecilomycesfumosoroseus): Biology, ecology and use in biological control 2008;18:865-901. Oladele OI. Contribution of Neglected and Underutilized Crops to Household food security and Health among Rural Dwellers in Oyo State, Nigeria. Symposium Proceedings, online publication of presented papers. International Symposium, Underutilized plants for food, nutrition, income and sustainable development, Arusha Tanzania. Colombo, Sri Lanka: International Centre for Underutilised Crops (ICUC) 2008. Kamatu GP, Viljoen A, Van Vuuren SF, et al. In-vitro evidence of anti-micro bial synergy between Saviachamelaeagea and Leontis leonurus 2006;72:634-636. Allamin IA, Borkoma MB, Abbas M, et al. Bacteriological quality of slicedfruits sold at road site in Maiduguri, BornoState Int J Environ 2015;4:236-242. Afolabi O, Oloyede A, Abibu W, et al. Microbial safety of polyethylene packaged sliced fruits sold in Abeokuta, South-West Nigeria J Natural Sci 2015;5:16-21. Nwachukwu E, Osuocha H U. Microbiological assessment of ready-to-eat sliced pawpaw (Carica papaya) and watermelon (Citrulluslanatus) vended in Umuahia, Nigeria. Int J Curr Microbiol Appl Sci 2014;3:910-916. Coulibaly-Kalpy J, Agbo EA, Dadie TA, et al. Microbiological quality of raw vegetables and ready to eat products sold in Abidjan (Côte d’Ivoire) markets. Afr J Microbiol Res 2014;11:204-210. Bakobie N, Addae AS, Duwiejuah AB, et al. Microbial profile of common spices and spice blends used in tamale, Ghana. Int J Food Contam 2017;4:1-5. Akusu OM, Kiin-Kabari DB, Wemedo SA, et al. Microbiological quality of selected street vended foods in Port Harcourt metropolis, rivers state, Nigeria 2016;5:8-11. Aiyeloja, Adedapo A, Opeyemi I, Ajewole, et al. Non-timber forest products’ marketing in Nigeria. A case study of Osun state" reproduction). Educational Research and Reviews, Academic Journals 2006;52-58. Odebisi-Omokanye M B, Oke M A, Ahmed El-Imam, et al. Microbiological Quality and Safety of pre-cut fruit retailed in Ilorin, Kwara State, Nigeria.Fountain Journal of Natural and Applied Sciences, 2015;4:19-26. Oje OJ, David OM, Adeosun OM, et al. Multiple antibiotic resistant Escherichia coli in ready-to-eat foods from food outlets in Ekiti State University and it’s environ 2016;13:1-11. Bao JY, Cai M, Sun G, et al. Anthocyanins, Flavonoid and Free Radical Scavenging Activity of thines Baybery (Myrial rubia) extracts and their colour prope rties and stability. Journal of Agriculture and Food Chemistry 2005;53:2327-2332. Marwa EAA, Tamer ME, Magdy AM, et al. Antibiotic resistance profile of E. coli strains isolated from clinical specimens and food samples in Egypt 2012;3:176-82. Ganu GP, Jadhav SS, Deshpande AD, et al. “Antioxidant and antihyperglycemic potential of methanolic extract of bark of mimusops elengi l. In mice,” International Journal of Phytomedicine 2010;2:116-123. Owabumoye BJ, Osuntokun OT. Evaluation of the viability and survival rates of some selected pathogens on artificially inoculated fruit juice in Iwaro & Ikare Akoko market store, Ondo state, Nigeria, International Journal of Applied Research 2015;5:66-70.